On Czech TV 23 years after running up to the Czech embassy gates, with a Havel-Beckett t-shirt | Jon Katz, P.C. Yesterday morning, I made a haircut appointment with a stylist who adores visiting the Czech Republic. Without any connection to that appointment, thirty minutes later, for the first time in my life, I got contacted by a Czech news reporter, asking to interview me on Czech television about the State Department’s current efforts to get U.S. citizen Kevin Dahlgren extradited to the Czech Republic on charges of murdering several family members. The Czech TV reporter and cameraperson — both named Martin, perhaps a popular name there — came to my office asking mainly general questions about where the case will go from here, including today’s hearing in Alexandria federal court, after I pulled up the online docket to see the case status. The extradition complaint (the government’s legal memorandum is here) claims that the United States has an extradition treaty with the former Czechoslovakia from before the communist era, which was supplemented in the post-communist era. I defended a few years ago in the same court against extraditing a gentleman who had been convicted in his native country in absentia, after the State Department official on the case, bless his heart and diligence — by the extradition hearing date, after a prior hearing date about bond — determined that State Department policy was against extraditing people on in absentia convictions in my client’s particular country. Consequently my client’s extradition case got dismissed. My interview is expected to be online here. I will post the link when I receive it. A big problem about extraditing Americans and lawful United States residents to other countries for trial is that the vast majority of countries protect criminal defendants’; rights much less than in the United States, where criminal defendants’ rights still get trampled on daily. From a practical standpoint, though, the United States will still enter into and honor extradition treaties, lest the U.S. have no mechanism to get wanted criminal defendants extradited to the United States. On the reverse side of extraditions, BBC-TV interviewed me a few times about the United States’ ultimately successful efforts to extradite Briton Christopher Tappin to the United States from the United Kingdom, for allegedly joining a plot entirely cooked up by undercover United States law enforcement agents to sell missile components to Iran. What hogwash to extradite someone from their native country for agreeing to join in such a crime made up by law enforcement. After the interview, I spoke with the interviewer and cameraperson about my glee over the Velvet Revolution that replaced the communists non-violently. He recalled being in middle school at the time, and one or both of his parents supporting the Velvet Revolution. He wished that the communists had been dealt with more firmly at the time, and said that as a result of no extra firmness, their heads are reared again in the Czech Republic. Yesterday’s Czech TV interview comes around 25 years after I bought a t-shirt from Index on Censorship with Havel on the front and Samuel Beckett on the back. Beckett dedicated his play Catastrophe to Havel. Subsequent to the Prague Spring, and starting long before Gorbachev, Vaclav Havel was repeatedly hounded and oppressed for his writings. 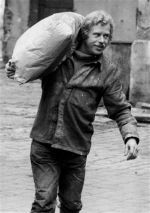 Index on Censorship once ran an article on Havel showing him smiling and carrying a sack of beer ingredients weighing down his body — but not his spirit — at the brewery where he worked. After Havel was selected president of Czechoslovakia, I excitedly wore the Havel-Beckett t-shirt on my long distance run past the Czech embassy near Rock Creek Park around 1990, around .1.5 miles from my then home, while a newspaper picture of Havel shaking hands with the then Czech communist leader was on my office bulletin board. I ran right up the gates, and gleefully pointed out my t-shirt to the man standing watch, apparently a security staff holdover from the communist regime possibly unsure of his employment fate with the Velvet Revolution, and apparently unsure how to react to my expression of happiness. The t-shirt wore out, but not my deep inspiration from and admiration for Havel, as a man; I did not follow his actions much as a government leader. I have no delusions that my excitement about the overthrow of tyrants and other human rights violators does not guarantee angelic nor excellent replacements, as underlined by Solidarity hero Lech Walesa, who as a government leader tows a hard line against homosexuality.